Featuring screen-capture images from MARVELS AVENGERS ASSEMBLE SEASON TWO!<br />The Avengers face the machinations of the Mad Titan himself - Thanos! And you know he must be bad when even the Red Skull is fleeing from him! Thanos seeks the cosmic Power Stone - but will the robotic Arsenal, built by Tony Starks father, help keep it out of the Titans grasp? 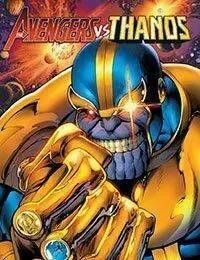 Thanos has targeted all the Stones necessary to form the Infinity Gauntlet - and if he succeeds, hell have ultimate power in the palm of his hand! Black Widow has a plan to save the universe - but it will take all of the Avengers to pull it off! Captain America and Iron Man dont see eye-to-eye, but can they put aside their differences in time to come together for the final battle to save everything? Collecting MARVEL UNIVERSE AVENGERS ASSEMBLE SEASON TWO #1 (A STORY), #2, #11-12 and #15-16.